We’d love your help. Let us know what’s wrong with this preview of Quality Research Papers by Nancy Jean Vyhmeister. 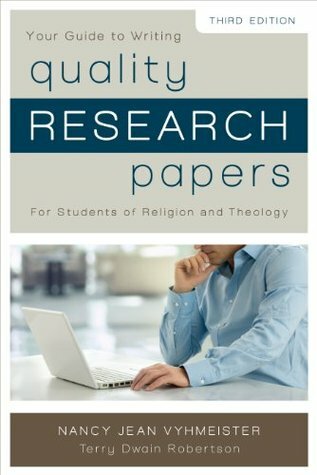 This updated third edition of Quality Research Papers—fast becoming a standard reference textbook for writing research papers in the fields of religion and theology—gives improvements and added material for such things as the expanding field of online research and doing church-related research in a professional manner. Quality Research Papers offers great opportunities to students today, especially in distant learning situations, to determine which resources can be used and which should be rejected. For this reason Nancy Vyhmeister brought in Terry Robertson, Seminary Librarian at Andrews University and professor of the seminary master’s level research courses. His expertise in library, computers, and the Internet are invaluable to the book. To ask other readers questions about Quality Research Papers, please sign up. Gave it 5 stars based on content. Not sure how to rate entertainment value! This is the clearest and best resource I’ve read on the topic. Aimed a theological research, this book does a great job of instructing on how to write book reviews, general academic papers, and dissertations. Probably one of the best books on the subject. It is very thorough, redundant at times but not without merit and very practical. It offers many clear examples. Very practical. Easy to read and apply. This is by far the most helpful resource I’ve encountered on the process of actually doing good, solid research. The author is very engaging in her writing style, yet very helpful in her material. I really can’t express how practical and helpful this book is and how useful it will be when it comes time to write my thesis. Nothing extraordinary. An acceptable primer for the research process without being buried in deep technicalities. It is also a good quick reference type of book when you are hung up on an issue.